Fixes issue with sharing checkins with Facebook and Twitter. Checkmate for Foursquare lets you check in automatically to your favorite places. Checkmate will run in the background and automatically check you in when you are close enough to a venue. No more awkward silence as everyone in your group pulls out their phone to check in! - Maintain control by only choosing venues you want to check in to. - Checkmate won't check you into a location if you do so manually. - Share your auto-checkins with Twitter and Facebook. - Share with friends or check in off the grid. - GPS mode for more accurate location tracking and checkins. 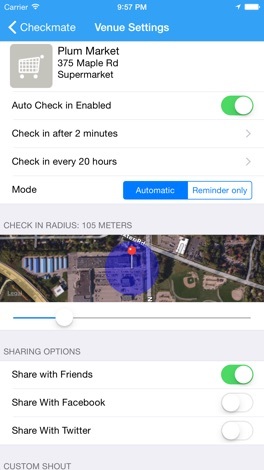 - Set a custom radius per venue for Checkmate to monitor. - Choose how often Checkmate will check you in for each venue. - Set a timer delay for Checkmate to check you in, eliminating drive-by auto check-ins. - Set a custom shout for each venue. - Slide gestures to quickly add and remove venues from your auto check in list. - Choose to automatically check in, or simply receive a reminder. Checkmate has been completely redesigned and is compatible with all devices that support iOS 7. Reviews: Rated 4/5 by Appsafari! Frasier Funniest Quotes This app contains more than 430 of the best and funniest quotes ever from the tv series Frasier. Read these quotes from your favorite characters any time. There is never a bad time for a quote from the gang we all love! Laugh will never be far away again! Fortune Cookie is a traditional treat made of flour, sugar, vanil and butter with a paper note hidden inside. Usually the note contains a wise saying or a sentence that predicts future. In this application you can receive the answer to an important question or find out what your fate has in store for you today. ทำนายดวงวันนี้ กับตั๋วรถเมล์ หมดปัญหากับการต้อง - จำว่าเลขนี้รวมแล้ว ผลมันเป็นอะไร - คำนวณแล้วผลมันได้เลขอะไร App นี้ เราคำนวณและรวบรวมมาให้ท่านแล้ว :P Horoscope today from bus ticket number. Input a bus ticket number and wait your horoscope. How I Met Your Mother Funniest Quotes This app contains more than 200 of the best and funniest quotes ever from the tv series How I Met Your Mother. Read these quotes from your favorite characters any time. There is never a bad time for a quote from the gang we all love! Laugh will never be far away again!